I was one of the 60 journalists who quit after Rupert Murdoch bought the Chicago Sun-Times in 1984, turning the paper into something that, as Mike Royko put it, a decent fish wouldn’t want to be wrapped in. So, I understand the fear and loathing that the employees of the Wall Street Journal feel at the prospect of News Corp. owning Dow Jones. But they may be surprised to hear me say that I think Murdoch will act decisively to protect the integrity and quality of the assets he is buying for $5 billion. Although Murdoch’s henchmen made a hasty hash of the Sun-Times with page-one screamers like “Men Can Have Babies, Too,” you have to believe that someone willing to shell out five big ones for a trophy like DJ will be far more sensitive and thoughtful than to send in the clowns who pillaged the Sun-Times 23 years ago. As Murdoch and his team soon learned, the radical remake of the Sun-Times was an embarrassingly poor business decision, proving to be as repugnant to readers and advertisers as it was to the newspaper’s staff. Murdoch extricated himself from the situation a few years later, when he sold the paper and plowed the profits, and then some, into the television stations that today are part of the Fox Network. Notwithstanding the long-ago fiasco at the Sun-Times, Rupert Murdoch didn’t build one of the world’s largest media companies by habitually making bad decisions. Quite to the contrary, he typically has a unique business plan for every property in his vast and varied portfolio, shrewdly targeting each to a well-defined audience and advertising niche. That’s why the Times of London is staid and stately – and American Idol is not. “Under Murdoch's ownership, the [London] Times has expanded its staff,” reports the Washington Post. “The paper now has about 495 journalists, including the online unit, and 20 foreign bureaus, a number that has doubled in recent years.” Impressively, its circulation, which had been stagnant at about 200,000 for decades, now tops 670,000 – a gain unmatched by any American newspaper. Although the Fox News Channel is a notorious pulpit for neo-con bullies and the New York Post teems with tales of Paris Hilton and Pervy Pete, each exploits large and lucrative market segments that were left wide open by the conventional, just-the-facts-ma’am media. Proofs of their success are readily apparent. The ratings of Fox News are twice as high as those of CNN and the Post’s circulation in the six months ended on March 30 gained 7.6% while the industry average fell 2%. It doesn’t follow, however, that Murdoch’s skill at turning dross into gold means he will turn the Dow Jones properties into political bludgeons or scandal sheets. Murdoch is paying a handsome premium to acquire the company to extend its valuable brands around the globe through the print, television and Internet assets he already controls (and intends to buy or build). In so doing, Murdoch would gain access to a hefty share of the premium advertising revenues associated with the media products that serve the most sophisticated and affluent people in the world. As reported in the New York Times and elsewhere, Murdoch historically hasn’t been squeamish about pushing his political and commercial agendas with the senior managers who run his media companies. But I think he will be more circumspect than ever at the DJ properties, because the whole world will be watching – and eagerly documenting any missteps in competing publications and the blogosphere. At the end of the day, the power of the marketplace will keep Murdoch honest. The business and financial reporting in the Journal, Barron’s and the other DJ brands are rightfully respected as being thorough, dispassionate and insightful (notwithstanding a few wobbles in reporting on the News Corp. overture). Eroding the credibility of the DJ properties would insult the intelligence of the readers and viewers that News Corp. covets, devaluing the franchises and perverting the premise of this very expensive transaction. That would be dumb. And Rupert Murdoch isn’t dumb. The senseless death of four helicopter newsmen in Phoenix underscores the stupidity and wastefulness of broadcasters who squander their precious resources on cheap chopper chases instead of more worthy pursuits. This journalistically indefensible insanity must be stopped. If broadcasters won’t do it voluntarily, then the Federal Aviation Administration, acting on behalf of us innocents on the ground, ought to step in and do it for them. As amply reported in all possible media, four television newsmen died Friday when their two helicopters collided in flight while providing breathless, live coverage of the inconsequential police pursuit of some schlemiel accused of running a traffic stop. After the copter crash, the police chief indicated he was thinking of charging the driver with murdering the newsmen, a bogus notion sure to be rejected by more competent legal authorities. While the tragedy is profoundly distressing, it is even more depressing to realize that the deaths of these men were as pointless as the story they were covering. Four good men lost their lives because unimaginative television news directors over the years have come to prize live video collected with expensive toys over stories characterized by greater subtlety and significance. Because cheap mayhem, unfortunately, is widely available on demand in most metro markets, stories about journalistically inconsequential murders, fires and rapes dominate more than two-thirds of the coverage of the typical TV newscast. As reported here previously, you are about 50 times more likely to view a local TV news story about a murder than one about science, child care or pollution. You are roughly 20 times more likely to “Eyewitness” a fire than a report on education, discrimination or marriage. Ever since the slow-mo aerial chase of O.J. Simpson and his white Bronco in 1994, news directors have dispatched their copter crews on costly missions to provide live footage of all manner of un-newsworthy traffic jams, fires and car chases. When I suggested here in April that the New York Times Co. might have to go private in a leveraged buyout, Newsweek columnist Jon Fine scoffed. While it is gratifying that Jon has come around to seeing the merit of the idea, the LBO-ing of the Gray Lady could be more difficult today than it might have been even three months ago. That’s because two major events have changed the landscape in the intervening time. One is Rupert Murdoch’s offer to buy Dow Jones, which is controlled by super-voting family shares similar to those held by the NYT clan. If a wealthy suitor slapped a Murdoch-sized offer on the table at NYT, the family would have to scramble to find far more money to buy the company than would have been required before an unsolicited buyer came a-calling. The more the family has to pay to beat an outsider’s offer, the more assets it would have to sell, the more money it would have to borrow and the more operating expenses it would have to trim. The other development since the spring is the sharp and sudden tightening in the availability of credit to fund a highly leveraged Tribune-style buyout of NYT. The lenders who liberally and inexpensively funded everything from sub-prime mortgages to Sam Zell’s aggressively-financed ESOP lately have begun worrying about the ability of borrowers to pay them back. So, they are increasing interest rates and, in some case, requiring buyers to pony up more cash to fund future transactions. Given the continuing, if not to say accelerating, deterioration of newspaper revenues, the credit clampdown could make it more difficult and more expensive for the NYT to go private today than if it had closed such a deal earlier this year. This is not to say NYT (or any other publishing company suffering from battered-stock syndrome) couldn’t go private if it wanted to. Going forward, however, the proportion of operating profits necessary to finance a newspaper LBO will consume a larger part of the company’s budget than if it had gone private before now. If revenues continue to fall and borrowing costs get steeper, the only way to make ends meet, as evidenced in places like Minneapolis and Northern California, will be to cut such variable costs as headcount and news hole. This might help get some deals done, but it's going to make it mighty challenging for newspapers to remain unselfishly devoted to the public welfare. Private Capital Management, once the most enthusiastic investor in newspaper stocks, has dumped more than $2.5 billion in publishing shares, or 62.5% of its holdings, according to new Wall Street research. PCM, which held $1.5 billion in newspaper shares at the end of March, became something of a household word in the newspaper industry when Bruce S. Sherman, its chief executive, forced the liquidation of Knight Ridder in 20o6. The aggressive selling by the Florida-based investment firm in the last 2½ years is one of the reasons that newspaper stocks have lost some $15 billion in value since 20o4, says securities analyst Paul Ginocchio of Deutsche Bank. As illustrated in the table below, PCM at one time owned nearly a quarter of the stock of such companies as Belo, Lee Enterprises and McClatchy Newspapers. Today, those positions have been reduced by more than half. 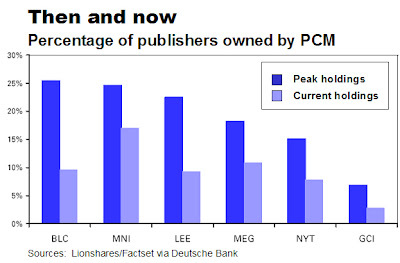 Other major PCM holdings that have been reduced significantly are the shares of Media General, New York Times Co. and Gannett. When PCM forced the sale of Knight Ridder, Bruce was counting on robust competition for the assets to boost the value of his extensive publishing portfolio. Quite the opposite occurred. The only bid for the company came from McClatchy Newspapers, which made a barely respectable offer – and then added insult to injury by dumping such venerable properties as the Philadelphia Inquirer and San Jose Mercury News. KRI shareholders who got a combination of cash and McClatchy stock at the time the sale were in for a rude shock, too. 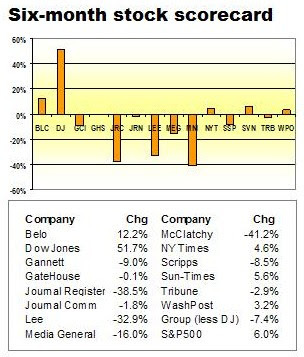 McClatchy’s shares have fallen 33.7% since June, 2006. Paul believes Lee’s shares may have been the most depressed by PCM, whose trading represented up to 9% of the activity in the issue in the last quarter of 2006 and the first period of 2007. “The ‘good’ news for Lee is that they are closer to the point where PCM has fully exited the stock than several of the other newspaper names,” says Paul. Depending on the speed with which PCM disposes of the other publishing stocks in its portfolio, it may take up to a year for Bruce to get clear of Media General, McClatchy and Belo. The publicly held newspaper stocks lost another $2 billion of value in the first six months of 2007 on top of the $13.5 billion decline they suffered in the prior two years. Bad as the 3.9% drop in value in the six months appears to be, the performance of the group actually is far worse, if you factor out the extraordinary $5 billion offer Rupert Murdoch made to buy Dow Jones. Taking away the $1.6 billion surge in the market capitalization of Dow Jones occasioned by the News Corp. bid, the value of the remaining newspaper stocks fell $3.73 billion, or 7.4%, in the first half of this year. By contrast, the Standard and Poor’s index of 500 stocks gained 6% in the same period. McClatchy led the slide in publishing stocks, collapsing by 41.2% from where it stood on New Year’s Eve. As detailed below, the other big losers were Journal Register, whose shares fell 38.5%, and Lee, whose stock slid 32.9%. Apart from DJ, the biggest gainers were Belo, up 12.2%; the Sun-Times Media Group, up 5.6%, and New York Times Co, up 4.6%. As discussed here earlier, newspaper stocks lost $13.5 billion of their value in the years 2005 and 2006, representing a 20.5% decline during the two-year period. Given that the 7.4% drop in share value in the first half of this year is more than a third of the loss experienced in the prior two years, it is clear that the decline in newspaper stocks has accelerated. The market’s verdict coincides with the queasy drop in newspaper ad sales in the first five months of a year in which the industry appears to be headed to a $2 billion decline in year-over-year revenues. This is occurring at a time when many, but not all, observers believe the economy is in a state of general well being. The dissenters doubtless would include the freshly unemployed newspaper workers who are trying to sell their homes. With newspapers struggling so badly now, you shudder to think what would happen if the economy got worse.